The Public Display of … Movie Props? Easter weekend brought another showing of the movie, The Ten Commandments. I confess I had to watch Charlton Heston, err…rather Moses, lead the Hebrew people out of Egypt and safely across the Red Sea. It’s one of those movies that I always have to stop and watch at least a couple of minutes, even though I have seen it numerous times. As part of his plan to spread biblical values, DeMille persuaded Paramount to pay for granite monoliths of the Ten Commandments to be placed in public squares across the country. Over 4,000 were made. One of these monuments, in Austin, Texas, became the basis for the Supreme Court decision in 2005 that allowed the Ten Commandments on public property if they had a secular purpose. 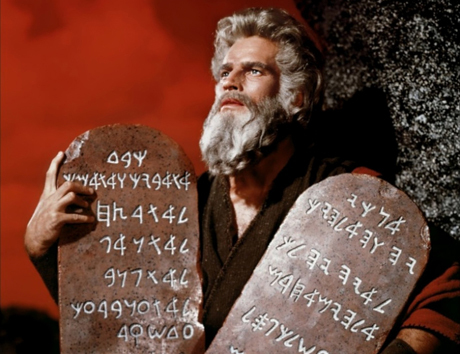 A publicity stunt for The Ten Commandments became the basis of landmark U.S. law. You can read my thoughts on the public display of the Ten Commandments and the other secrets mentioned in the full article, but I wonder if it would change the conversation to know that some of the monuments being fought to preserve were remnants from a marketing campaign – albeit perhaps a well-intentioned campaign – to promote the movie? The description of Lot 422, cited in the complaint, says the “Ten Commandments tablets written by the finger of God” are “(c)onstructed of richly hewn fiberglass on wood backing … in an early Canaanite script practiced in the late Bronze Age (c. 13th century B.C.) Moses era. These tablets were created by Paramount Studios scenic artist A.J. Cirialo, who made them to be slightly irregular with molded chips, craters and dings since they were to be cared with God’s fire bolts, and he painted them in great detail to appear as carved stone.” The tablets come with a letter of authenticity from Cirialo’s family and are in “fine condition,” according to the lot description. So the Ten Commandments find themselves back in the courtroom, the center of another legal dispute. If the movie prop sold for $60,000, it makes you wonder what the originals would sell for? In Connellsville, Pennsylvania a battle is currently taking place over a Ten Commandments monument at Connellsville Junior High School. A lawsuit has been filed for the removal of the monument but public support is growing to keep it in place. The same group that filed the lawsuit at Connellsville, the Freedom From Religion Foundation, has filed a similar lawsuit to have a Ten Commandments display removed near Valley High School in the New Kensington-Arnold School District. In Kalispell, Montana a small Ten Commandments monument remains in place next to a juvenile detention center while the city council determines whether it is appropriate to move it to a public park or remove it completely. In Alabama, judge Roy Moore, who was removed from office in 2003 for his refusal to comply with an order to remove a Ten Commandments monument, seems poised to gain his post back in next week’s election. My concern is more spiritual in nature: that in fighting to keep the Ten Commandments on display, we people of faith fool ourselves into thinking we are living out God’s commandments for the world around us to see. The Hebrew Scriptures record that Israel often fell into the trap of thinking they were being God’s people simply because they were going through the religious motions – tithing, going to the Temple, pointing to the presence of religious images all around them. But in reality, the way they actually lived out their lives did not reflect any of these elements of faith. So my intention as expressed in the book is not to argue that the Ten Commandments should or should not be displayed in public places. Yet there is an aspect to these cases that embody a troubling trend in our culture. And it is captured in the name of the group bringing the court cases in Pennsylvania – the Freedom From Religion Foundation. One of the freedoms the United States was founded upon was the freedom of religion. I can worship how I want and you can worship how you see fit. And both can rest assured the the government will not infringe upon our right to worship. But in the last several years, our freedom of religion has been increasingly redefined as freedom from religion. It is not religion that needs protection from those in power, but those in power should be shielded from any religious influence. You are free to worship how you see fit as long as it is confined to your private life and does not offend anyone else. It is with this new interpretation that we are robbing ourselves of of both historical context and valuable dialogue between people of different faiths, as well as between the religious and irreligious. Freedom from religion means that we don’t have to confront anything that might make us uncomfortable or grow to understand someone else’s perspective. And ultimately freedom from religion actually strips us of our freedom of religion. I guess what I am saying is that as a Christian I don’t need to have the Ten Commandments on display everywhere I go. But as a citizen of the United States, there are historical displays that have both religious and cultural meaning that need not be hidden away because someone wants total freedom from all religion. Having traveled to many different countries and experienced a variety of different cultures, it would truly be a tragic loss if all cultural, historical, and religious icons that had a hint of religious meaning were removed from public display. Now that would be offensive! The real reason that we can’t have the Ten Commandments in a courthouse: You cannot post ‘Thou shalt not steal,’ ‘Thou shalt not commit adultery,’ and ‘Thou shalt not lie’ in a building full of lawyers, judges, and politicians. It creates a hostile work environment. Perhaps he was on to something!